I just came across some news on MobiStation in Uganda and the first thought I had was that is a good example of another good appropriate technology initiative destined to fail. Every year, UNICEF sends out millions of School-in-a-Box kits for children affected by emergencies. Exercise books, slates, pencils, rulers, and other learning materials enable a teacher and up to 80 students, taught in double shifts of 40, to create an instant classroom – no matter where they are. Originally designed for refugees following the Rwanda crisis of 1994, School-in-a-Box has become the hallmark of UNICEF response in disasters. Twenty years later, in the era of Information Technology, UNICEF is pioneering a new type of digital School-in-a-Box. 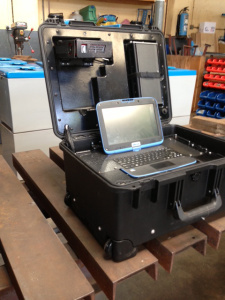 MobiStation, developed by UNICEF Uganda, is a solar-powered multimedia kit complete with a laptop, projector, scanner, and speakers, all contained in a portable suitcase. Detailed content in this article. It works by projecting e-books, teaching videos, and other multimedia content in rural schools and health centers, bringing quality learning to marginalized groups. The educational content for MobiStation is developed and recorded by the country’s top teachers in subjects like English, math, social studies and science. Technology is not going to solve political and social problems. Teacher absenteeism will not disappear with the MobiStation. Instruction will not be …………….. better! Alright? (all people in Uganda know what I mean here). Lack of textbooks? How is MobiStation going to provide textbooks for classes of 100 students that have hardly pen and paper? The educational system in Uganda – like many African countries – is sick to the bone. Teachers stay home because they are not being paid in spite of all promises. Schools are run like prisons, corporal punishment and humiliation are rampant and a situation is created where neither staff nor students are motivated. There is no drive to innovate teaching methods in this environment. Government is looking away when it comes to individual schools. They rather like to impress donors with hollow phrases like “to provide for, support, guide, coordinate, regulate and promote quality education and sports to all persons in Uganda for national integration, individual and national development”. If these basic conditions are not improved, MobiStation is not going to change anything in Uganda. The MobiStation is just going to end up as the private home cinema center for the headmaster. Technologists are sometimes remarkably poor thinkers when it comes to social change. They forget that technology may support change but it will never bring about change. Change comes from individuals, social systems, governments, not from technology. So if they believe that MobiStation will change Uganda, I am certain that this will become a great story for the next ICT4D Failures conference. Is MobiStation a good tool? YES, it is marvelous tool but to be used in emergency situations where schools have collapsed, libraries burned, but motivated teachers are on the ground. MobiStation will support these teachers to keep their students in ‘school’, to assure that the lives of the young school kids remains a bit ‘normal’ and it will bridge the gap until schools are being rebuilt. So, let’s forget about Uganda and see what the MobiStation can do in Gaza, the Central African Republic, Syria etc. The acronym MOOC is becoming more and more familiar. It stands for “massive open online course”. It refers to a web-based class designed to support a large number of participants. Coursera is an important example. It is an online learning system launched by Stanford University and it offers online courses in maths, science and humanities. Another important example is edX (Harvard and MIT) offering online courses in computer science, health research and chemistry. And all these courses are free of charge! 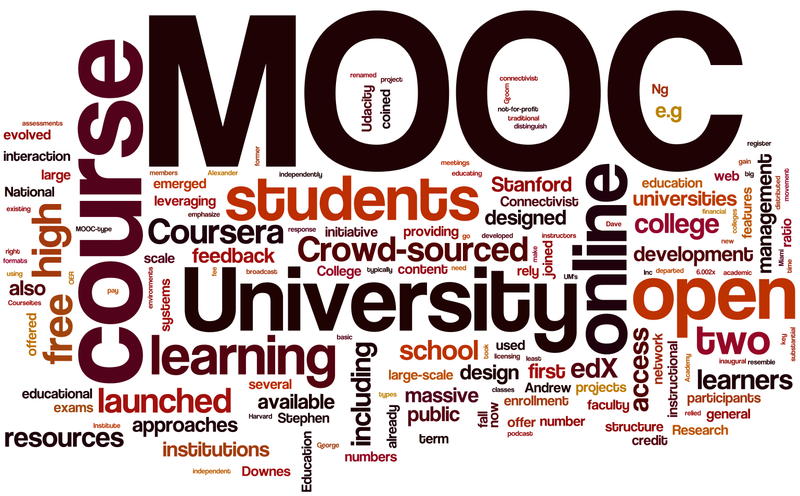 For an overview of Moocs: see the Comprehensive List of MOOC (Massive Open Online Courses) Providers by Tarique Haider. It is very instructive to follow a course at edX or Coursera. I did enrol myself in three courses. Typically, when you enroll in a MOOC you watch video lectures, you are asked to do sme reading and you interact with instructors and fellow participants in online forums. Sometimes you are required to take online tests or quizzes with multiple choice answers that are graded automatically. I guess that in the beginning you are completely overwhelmed by their offerings, overwhelmed by all the courses you can take. Have a go at one of the courses offered by these famous and highly ranked universities. A key advantage of MOOCs over traditional classroom-based learning is their convenience. MOOCs offer a self-determined pace of learning so that you may study according to your own schedule (although some do have start and completion dates). This also gives you the opportunity to re-watch parts of the lecture that is more challenging . Although MOOCs make high-quality education accessible to the masses, there is also reason for scepticism. Despite much excitement about how MOOCs might transform the education system, they have so far not been able to prove how effective they are. The first question is whether online platforms can maintain their high-level standards online. Because very quickly you notice that you are one of the many, many students taking a course. For example: A service desk is sending standard answers to you when you raise a question. Education is not only about high quality content. The educational process should also be high-level. Offering a high-level process is difficult with the massive number of students attracted by MOOCs. Another issue is the high drop out rates in MOOCs. It is not uncommon that courses only show a 5% pass rate. Phill Hill looked at this phenomenon in more detail and he identified 4 types of students that attend MOOCs and observed their behaviour. Lurkers – This is the majority of students within xMOOCs, where people enroll but just observe or sample a few items at the most. Many of these students do not even get beyond registering for the MOOC or maybe watching part of a video. Passive Participants – These are students who most closely align with traditional education students, viewing a course as content to consume. These students typically watch videos, perhaps take quizzes, but tend to not participate in activities or class discussions. Active Participants – These are the students who fully intend to participate in the MOOC, including consuming content, taking quizzes and exams, taking part in activities such as writing assignments and peer grading, and actively participate in discussions via discussion forums, blogs, twitter, Google+, or other forms of social media. Drop-Ins – These are students who become partially or fully active participants for a select topic within the course, but do not attempt to complete the entire course. In order for SPOCs to be successful, students are selected, to limit numbers of participants, and to ensure they satisfy entry requirements for the course. SPOCs allow institutes of higher education to use them in a “blended learning” approach that combines self-study with tools such as Skype or Google Hangout to support online classes. The advantages are clear, individual attention can be given to students and progress – or drop out – can be closely monitored. Maybe even more important with individual attention for the students, high-level subjects can be addressed in a SPOC style approach. As Oremus concludes: Whether or not SPOCs amount to some sort of pedagogical revolution, it seems clear that they hold more promise than pure MOOCs when it comes to delivering students a full educational experience—not to mention saving academics’ jobs. For us the key question is whether MOOCs or SPOCs provide an appropriate answer for the failing education system in Africa. Akua Djane describes the problems with education in Africa in a clear, touching but also worrying manner in her blog post Education in Africa is Failing its People. Many of these problems will not be solved over night and if we do not find answers another generation will receive poor or at least mediocre eduction. The challenge for Africa is in capacity development and dedication to profession of lecturer. MOOCs could be a great tool for lecturers to develop and renew their knowledge and skills. In many universities in Africa lecturers use ‘yellow papers’ to teach, that is, they are pass on their own lecture notes to the new generation. MOOCs can help to replace these notes with new materials. With the new knowledge and skills the SPOC approach can be used to provide quality education to the new generation of students. Now that Internet services are more and more available also in rural areas, more people can be reached. SPOCs are emerging in Africa. The Virtual University of Uganda is one of them. Through blended forms of online learning they try to develop an answer to the challenge of bringing high level education to East Africa. Both authors are part of this initiative. The key to improvement of education will however be determination to excel and innovate. Government regulation and policies need to think on how to integrate the new ways of teaching and university administrators will to start thinking in global solutions. MOOCs and SPOCs provide an alternative to allow education in Africa to leapfrog, but ultimately, the lecturers will have to be determined and motivated to make it happen. 7 predictions for future research?